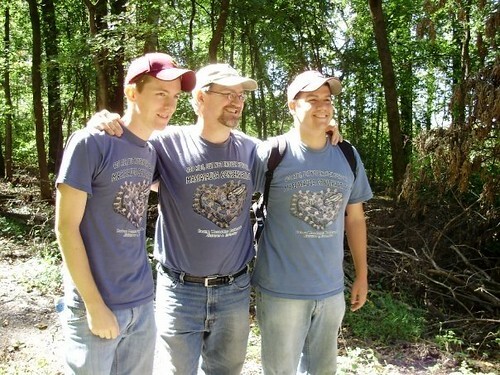 One of the most rewarding experiences about field herping is that it allows you to meet other herpers from different regions of the country who share the same passion that you do. Over the years, I've been fortunate enough to meet some really interesting people from all over the country, from out west in Colorado, southeast to Florida, and north to Canada. 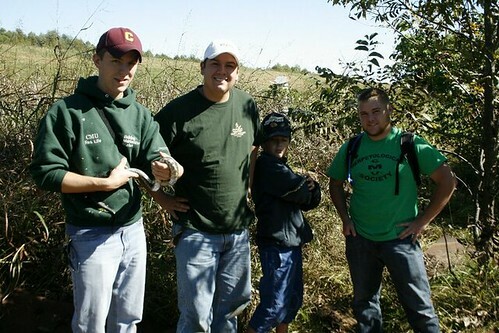 I'll just share some photos from the past few years of various herpers I've had the pleasure to herp with over the past few years. I hope than the coming year will give me more opportunities to get into the field with some old friends and meet some new faces as well. Until then, happy herping! Many of the more glamorous or rare species of reptiles and amphibians often get the most attention throughout the herpetofaunal community. 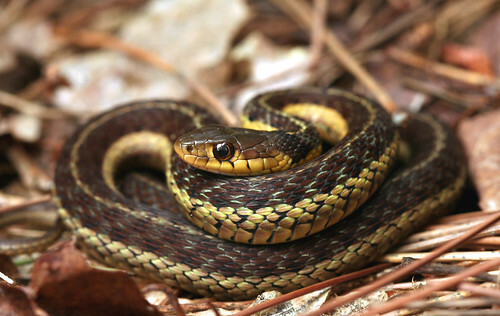 Often, some of the more extremely common species are overlooked and discarded as "trash" snakes that are as common as dirt. 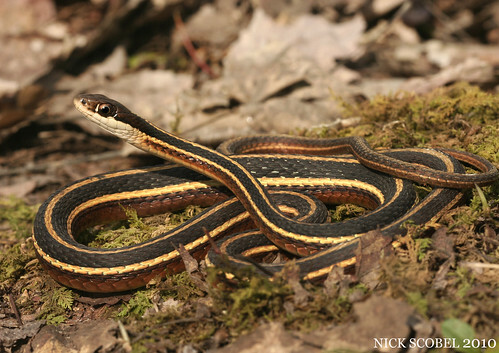 In Michigan, there is no group of herps that is more over looked than the genus Thamnophis, the Garter Snakes. 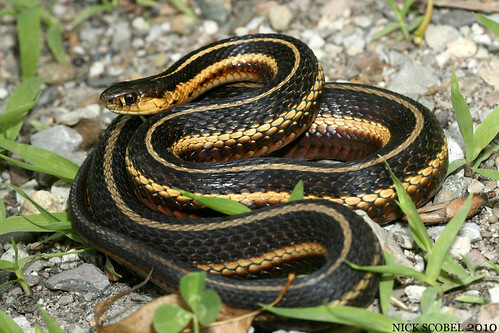 The Wolverine state is home to three species of Garter Snake which include the Eatern Garter, Butler's Garter, and the Northern Ribbon. 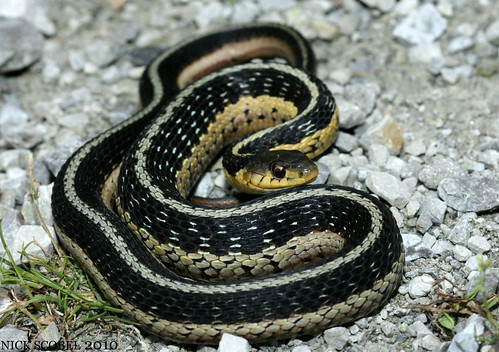 I'll begin with the less known of the three, the Butler's Garter Snake. This small snake species is less common than its other two counterparts in Michigan. 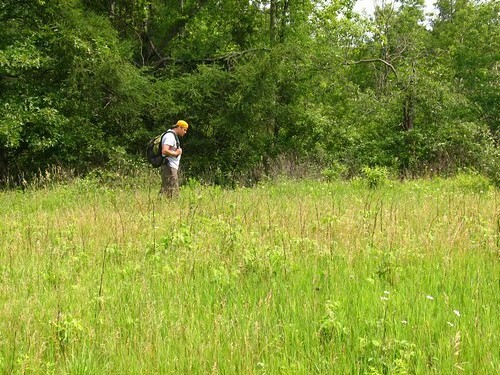 It inhabits meadows, grasslands, marshlands, and vacant lots in the eastern half of the lower peninsula. Though it has a spotty distribution, they can be found in huge number at sites where populations exist. 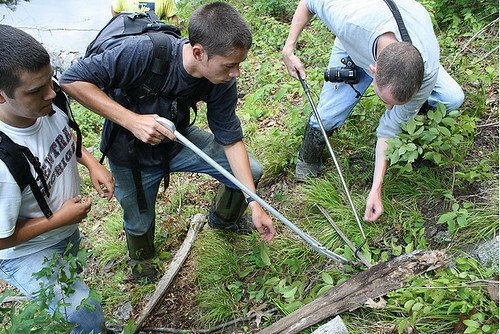 Butler's Garter Snakes are easily confused with Eastern Garter Snakes to the untrained eye, but there's a few practical ways to distinguish between the two species in the field. Butler's are usually smaller in general than Easterns, and they have a much smaller head in comparison to their body. 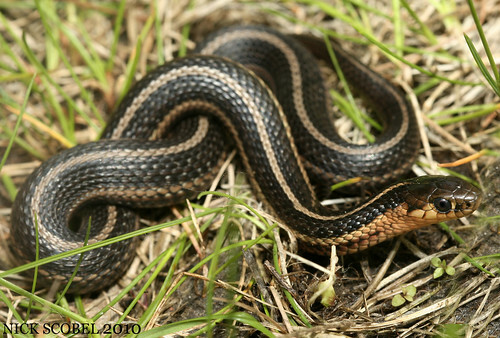 A good field mark for a Butler's Garter Snake is a small, dark, bullet-shaped head which has little distinction from the neck. This species consumes mostly earthworms in the field, but it will also take slugs and small amphibians. This is the "Gardener" snake that most Michigan residents are most accustomed to. It can be found in almost any habitat in Michigan including woodlands, grasslands, marshes, fens, city lots, and backyards. It is a medium sized snake that is usually characterized as a dark-ish snake with three bright stripes running down its body. This snake is highly variable in cover, some individuals can be black, brown, olive with yellow, white, or even orange-ish red striped. Some individuals may even be completely black, this is known as melanism. It is usually much larger than the Butler's Garter Snake and its head it usually larger than the body in comparison to the Butler's. Eastern Garter Snakes are not picky eaters as they are known to feed on earthworms, slugs, frogs, toads, rodents, and occasionally other snakes. 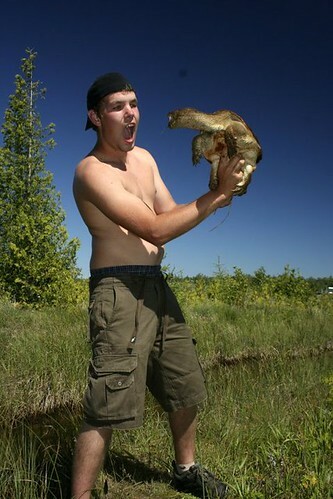 This attractive species is the third and final species on the list. 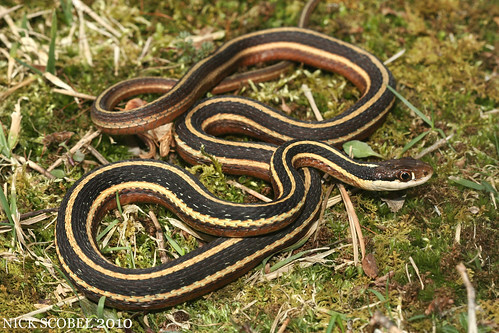 Unlike its other two cousins, the Northern Ribbon Snake is a long, thing snake with a whip-like tail. It is easily distinguished by its white cheeks, large eyes, and white spot right in front of each eye. This species is much more of a wetland species and is often found near fens, river, ponds, and other marsh-like habitats. It is an amphibian lover, and one of its favorite species is the Spring Peeper and other small Anurans. These three snakes may be common, but they all serve vital places in Michigan ecosystems and are an important part of Michigan's flora and fauna. 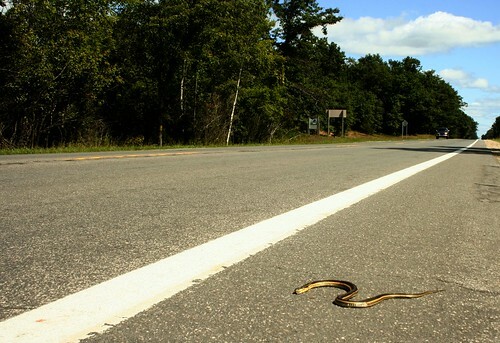 Although there are many threats to Michigan reptiles & amphibians, one of the greatest obstacles they face are roadways. Every year, thousands of herps lose their lives on roadways as they attempt to cross from one patch of habitat to another. This is a cruel reality as the human population continues to increase and expand our borders outward. More roads are necessary, and often these roadways cut right through ideal habitat for common and protected species alike. 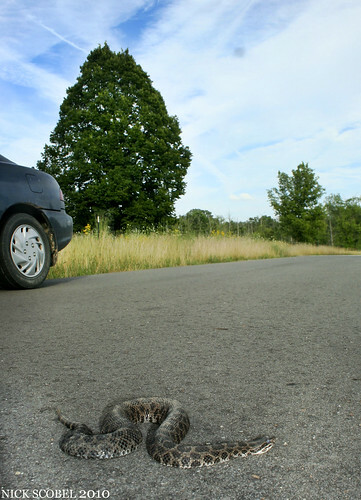 Even parks have this issue in the state, especially some of the parks in southeast Michigan which hold populations of Eastern Massasauga Rattlesnakes. 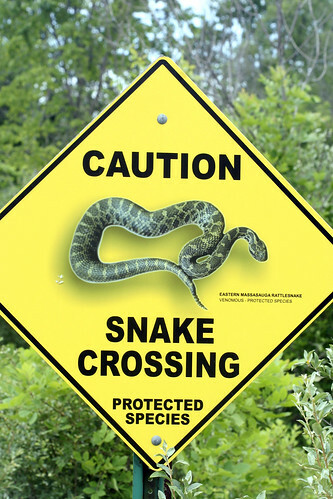 Some parks have experienced such losses due to road mortality that they have posted snake crossing signs to warn motorists in the parks to be mindful of rattlesnakes crossing the road. 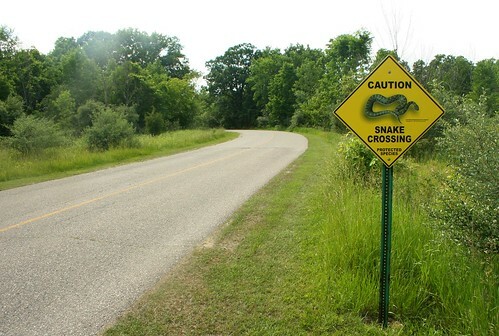 But snakes don't face nearly the same threat that roadways present in comparison to Michigan's turtle species. In the late spring and early summer, female turtles head for high ground in search of suitable nesting sites. 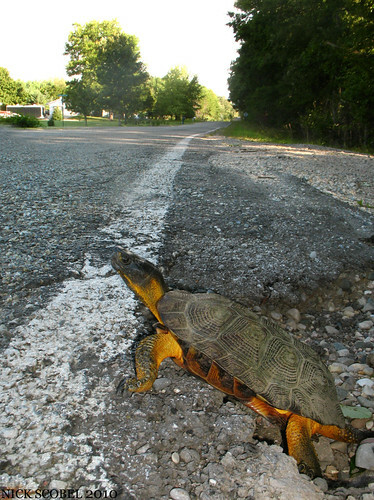 Unlike a snake, turtles are not quick and often mozy their way across roads where motorists often hit them untinentionally or sometimes intentionally. In this case, large numbers of turtles are being lost, and whats worse is that it is the females which are carrying potential offspring that take a major hit. 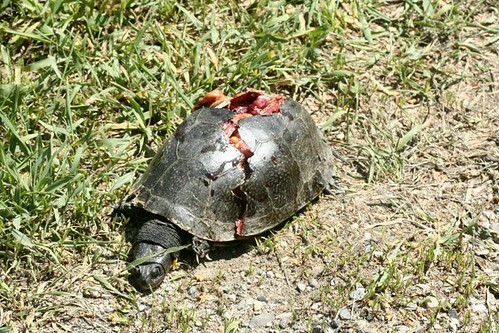 This coupled with nest predation has taken a major toll on Michigan turtle populations. Some side roads receive less traffic and these areas give some turtles a fighting chance, like this female Blanding's Turtle found nesting along a roadside in southeast Michigan. Unfortunately, not all individuals are are lucky as this female. In another county, this poor girl was found on the side of the road alongside many other females of various species including Snapping Turtles, Musk Turtles, and Midland Painted Turtles. 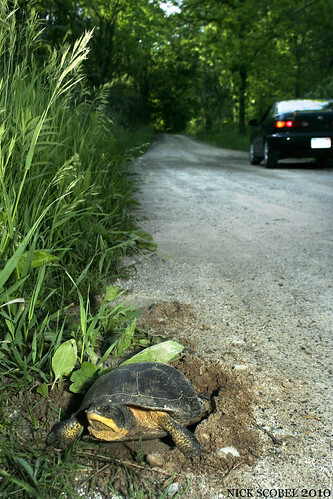 Other turtle species also are at risk to road mortality. 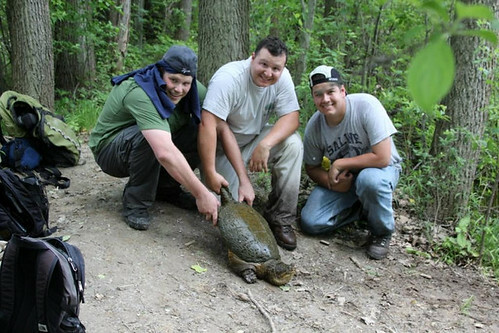 Of all of Michigan's turtles, it is the semi-aquatic Wood Turtle and terrestrial Eastern Box Turtle that tend to cross roads at particular tunes if the year. Both of these species are tough to miss on a road, and sadly get hit by oncoming traffic more than they should. Although it is impossible to eliminate road mortality, it is possible to raise awareness to help combat it. In the spring, watch out for migrating salamanders on warm rainy nights in April. 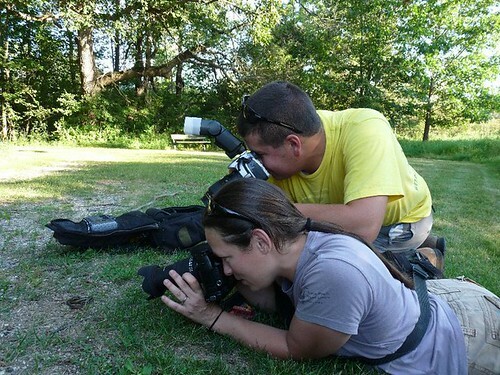 In May & June, watch out for turtles looking for nesting sites. And in the fall, be mindful of snakes that are heading back to their hibernation sites for the winter. 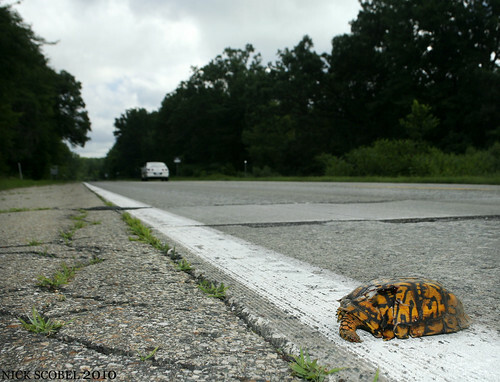 If you see a herp attempting to cross a road, do it a favor by helping it across and then leaving it be, you may not make a huge difference in the large scheme of things, but it would help that individual get across without losing its life to passing traffic. So next time you're out there, give 'em a brake!